One wonders from what twisted recesses of his psyche did the idea for this film come. “Symbol” by its very title clues us in to the fact that the meaning of everything we see on screen is far larger than it may appear. Matsumoto’s film at first comes across as a bizarre self-contained double feature. One narrative strand follows a lucha libre wrestler in Mexico known as Escargot Man (“The Children’s Hero”) and his family as he prepares for a tag team match with much younger opponents. In the second narrative strand, a man in polka-dot clown pajamas (Matsumoto) awakens to find himself trapped in a bare white room surrounded by cherub penises, which when he touches them, dispense random objects: bonsai trees, megaphones, sushi rolls, manga volumes, a tribal African runner. The man attempts to get over his bewilderment and figure out the proper combination of actions that will allow him to escape this prison. “Symbol” is a very difficult film to write about without completely giving away all of its myriad gifts. Matsumoto’s comic timing, sense of composition, and associative editing are a wonder to behold, and demand to be seen on the big screen. The two story strands do eventually come together, in a way that is wonderfully unpredictable and unexpectedly philosophical, and implicate a much larger canvas than what is covered in these two weird tales. Writer, director, and star Matsumoto has made a film that reaches both comic heights and metaphysical depths, with a command of film language that belies the fact that this is only Matsumoto’s second film. Matsumoto, a popular comedian in Japan, made his debut with “Dainipponjin” (“Big Man Japan”), a clever reinvention of the kaiju eiga (Japanese monster movie) genre. As hilarious and innovative as that film was, it was flawed and remained mostly an exercise in outré quirkiness. However, with “Symbol,” Matsumoto has made an artistic quantum leap that is nothing short of astonishing. 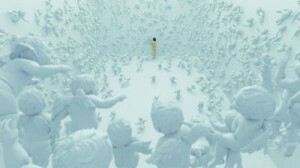 “Dainipponjin” was the work of a funny guy who made a funny movie; “Symbol” is the work of a true, and vital, filmmaker. “Symbol” screens at the Walter Reade Theater on July 4 at 1 p.m. and July 7 at 3:40 p.m. as part of the New York Asian Film Festival. For ticket information, check the Film Society of Lincoln Center website.